One messy sandwich. That’s what you get when you put an entire celebration dinner’s worth of courses (minus dessert) into a sandwich and press down with both hands. This isn’t a new idea to many of you, but I owe my familiarity with this concept all to my cousin, Cindy. As a kid I had the good fortune of sleeping over at her house one holiday night and therefore waking up to the leftovers that greeted her deserving family of hosts the next day. Her family was the one to throw the epic “invite everyone remotely related to us for this fantastic feast that turns into a dance party” party every year, and the leftovers were epic too. 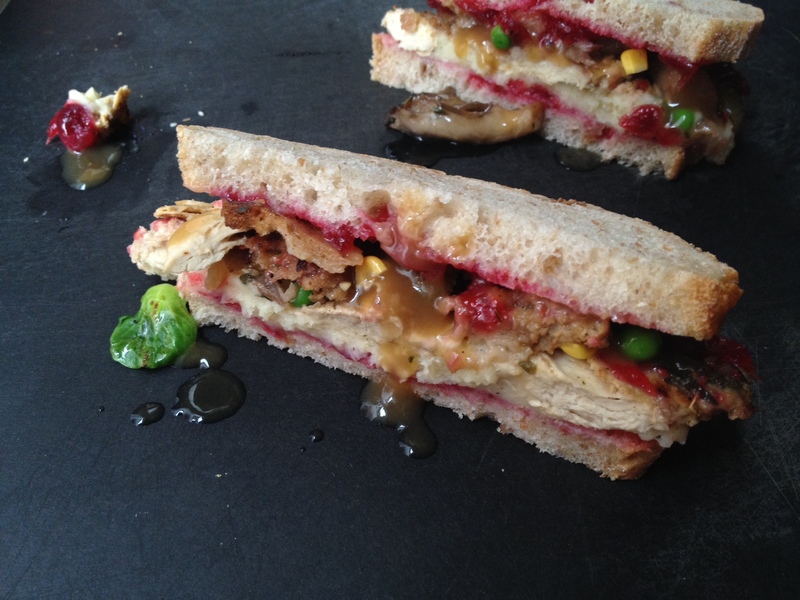 That morning she started making this sandwich as if it was the most normal thing to do: cram leftover turkey, stuffing, mashed potatoes, cranberry sauce, peas, corn, ham, Brussels sprouts, etc. between two pieces of bread too weak to hold even half of the fillings before it was drowned in gravy, while I stared and worried. I didn’t even like some of the scraps she was piling and poking into place, and I highly doubted I wanted them in a sandwich that…looked like this. I ate because I had to decide quickly, because she was eating quickly, quite frankly, and I didn’t know what other breakfast option I had. Of course I loved it. It’s like the ultimate, roasted everything, French dip, sweet and savoury sandwich. And of course my appreciation for it doubled the minute I realized it’s basically a once-a-year thing. Probably my favourite Thanksgiving “recipe” of them all.